On the inside, the typeface went the other direction. Strong winds that day, I guess. Construction was begun at the end of the boom; the owners went bust, and it took 18 years to resme work. 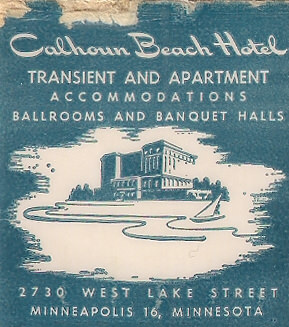 In the 50s it went bankrupt, and was turned into apartments - I'm guessing this matchbook hails from that bad patch, since it still says "Hotel." When it was "Calhour Beach Manor in the 60s, it was an old-folks home. It's been renovated and returned to duty as an apartment building, and is now one a prime locale on the lake. I met my wife here at a party, so I've always had a soft spot for this one.